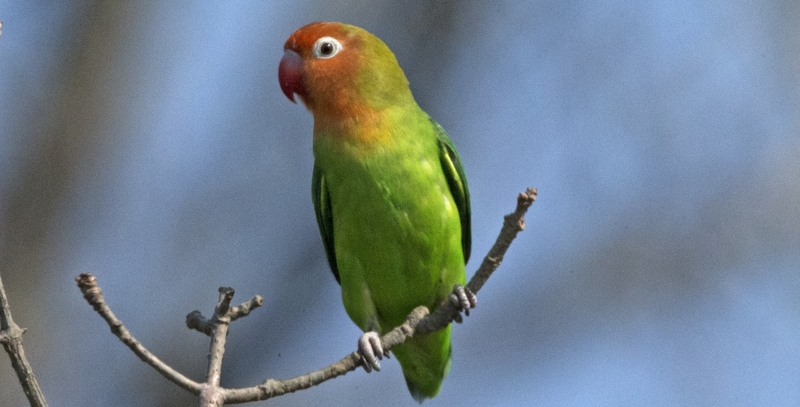 The Nyasa Lovebird (frequently referred to as Lilian’s Lovebird overseas), occurs in a small range from Southern Tanania, Zambia-Zimbabwe border distherict, Northwest Mozambique, Southern Malawi, usually in river land valleys up to 1000m in elevation. The current wild population’s last stronghold is the Liwonde National Park and a few pockets close by. The Liwonde National Park is located in southern Malawi. The birds occur in flocks of 20 – 100, feeding on grass seeds, millet, sorghum, seeds of annual herbs, flowers, berries and leaf buds. They tend to inhabit area’s where Fig and Mopane forest occur. They are currently regarded as near threatened, with the wild population estimated to be about 10,000 at best 20,000.They are subject to the usual pressures, habit destruction/fragmentation for farming outside designated National Parks. Also flooding of the Zambezi river valley by Lake Kariba and the Cahorra Bassa Dam in Mozambique, trapping for the Pet trade prior to 1981 when CITES legislation was introduced, albeit local trade does apparently occur. Recent reports of persecution by farmers as an agricultural pest, including waterhole poisoning. Sometimes confused with the Fischer’s lovebird, the Nyasa is a slightly smaller bird with the general colouration brighter than that of the Fischer’s. The facial area, extending to behind the eyes, is bright orange red with the back of the head being yellowish green. The remaining plumage is a strong green colour. When Nyasa’s are of pure blood, the rump and tail show a clear light green. The bill is a bright red fading to a light horn colour close to the cere. The eye is also adorned with a white eye ring. Feet are a bluish grey. A lutino and Pastel exists in Australia. In some literature a Blue mutation is said to exist – overseas.